Johannes Brahms was a German composer who gave the world a body of great music: chamber and piano works, three concertos, four very beautiful symphonies and other orchestral works, a requiem in the German language and other choral compositions, lieder and arrangements of folks songs. As a young man, Brahms was befriended by Schumann, who after meeting the 20-year old composer and hearing him play his C-Major piano sonata, rightly pronounced him a genius. Brahms was largely self-taught, carefully studying the masters who proceeded him such as Bach, Mozart and Haydn, and even the great composers going back to the Renaissance period. His breadth of studies was truly amazing: Caldara, non Papa, Gabrieli, Hassler, Victoria, Lassus, Marenzio, Palestrina, Praetorius, Schutz, Cherubini and Gluck. He amassed a collection of music and music books that numbered in the thousands, some of these being very valuable. He was the owner of the autograph score of Mozart's G minor Symphony, K550, Haydn's opus 20 String Quartets and the sketchbook that included sketches for Beethoven's masterful hammerklavier piano sonata. He also had a lifetime interest in folk music and was a tremendous melodist. Tunes he learned from his friend Eduard Rem�nyi, from books and from Hungarian cafe musicians became his famous Hungarian Dances that helped earn him enough money to pursue music composition without having to pander to other tastes, and to work at his studies without having to struggle for income. Brahms continued the tradition of Beethoven in his symphonic and chamber works, but because he lived in the time of Liszt and Wagner, he was heavily condemned for writing in style that was considered out-of-date. Critics also accused Brahms of being an inadequate orchestrator, writing that his symphonies lack the color found in the scores of other composers, such as Berlioz and Rimsky-Korsakoff. In fact, during the second half of the 19th Century, instrumental color became an important aspect of musical composition, and this tendency was fully realized later in the works of Ravel. 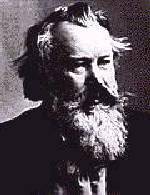 But in truth, Brahms orchestrated his symphonies very suitably, in a manner that did not detract from the brilliant music itself, as Brahms was, next to Beethoven, perhaps the greatest developer and expander of melody of all composers.